There is reason for grave concern about the direction of U.S. trade policy. The bipartisan, pro-trade consensus that served U.S. economic and diplomatic interests so well for so long collapsed during the final two years of the Bush administration. Trade skeptics have increased their ranks in the new Congress, a majority of Americans perceive trade as threatening, and grim economic news has made the political climate inhospitable to arguments in support of trade. 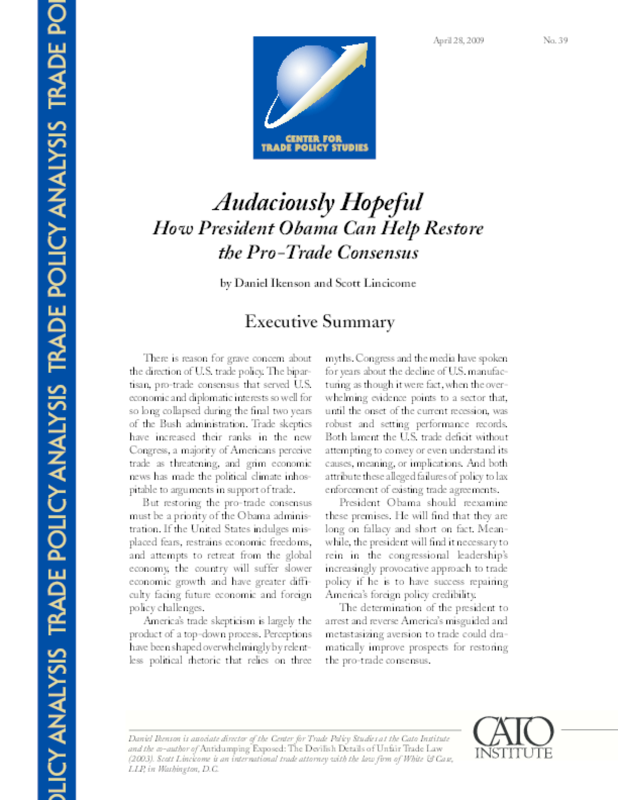 But restoring the pro-trade consensus must be a priority of the Obama administration. If the United States indulges misplaced fears, restrains economic freedoms, and attempts to retreat from the global economy, the country will suffer slower economic growth and have greater difficulty facing future economic and foreign policy challenges. America's trade skepticism is largely the product of a top-down process. Perceptions have been shaped overwhelmingly by relentless political rhetoric that relies on three myths. Congress and the media have spoken for years about the decline of U.S. manufacturing as though it were fact, when the overwhelming evidence points to a sector that, until the onset of the current recession, was robust and setting performance records. Both lament the U.S. trade deficit without attempting to convey or even understand its causes, meaning, or implications. And both attribute these alleged failures of policy to lax enforcement of existing trade agreements. President Obama should reexamine these premises. He will find that they are long on fallacy and short on fact. Meanwhile, the president will find it necessary to rein in the congressional leadership's increasingly provocative approach to trade policy if he is to have success repairing America's foreign policy credibility. The determination of the president to arrest and reverse America's misguided and metastasizing aversion to trade could dramatically improve prospects for restoring the pro-trade consensus.